Home Resources Career What would design nirvana look like? 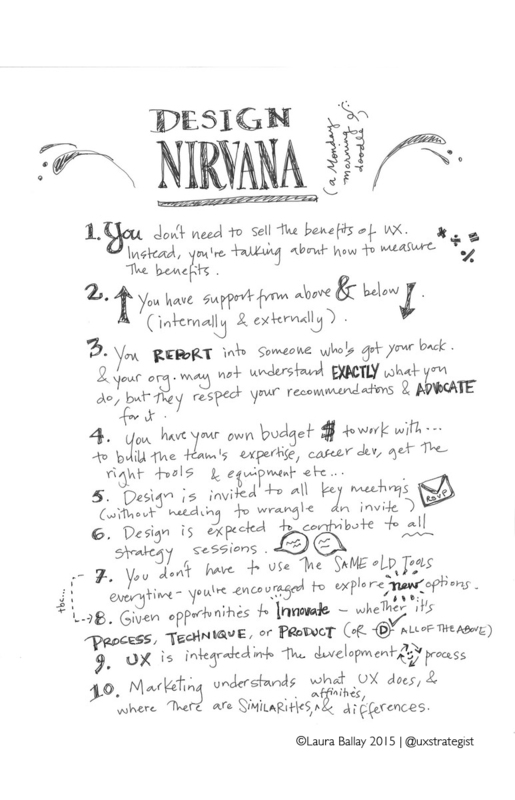 A Monday doodle/wish list from a few years back about the makings for an ideal design leadership role. Still true. Good wish list to have in hand when you’re considering an offer or taking a peek behind the organizational curtain. You don’t need to sell the benefits of user experience design. Instead you’re talking about how to measure the benefits. You have support from above and below (internally and externally). You report into someone who’s got your back and your organization may not understand exactly what you do but they respect your recommendations and advocate for it. Design is invited to all key meetings (without needing to wrangle an invite). Design is expected to contribute to all strategy sessions. You don’t have to use the same old tools everytime — you’re encouraged to explore new options. You’re given opportunities to innovate — whether it’s process, technique, or product…or D) All of the Above. User experience design is integrated into the development process. Marketing understands what user experience design does and where there are similarities, affinities and differences.